We would highly recommend hiring Tharindu as a driver. 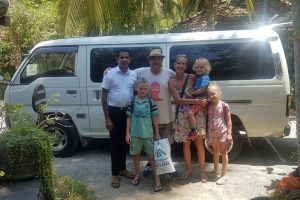 He picked us up from the airport at 6:00 AM and drove us to Sigiriya. He is super friendly, we had the chance to chat a lot about the culture of Sri Lanka on the ride. He offered us advice and also helped us exchanging money, doing some shopping on the way and getting a sim card. He has a clean sedan (Honda) with AC.